Correction: A previous version of this story incorrectly stated that there were 30 senators in the Undergraduate Senate: one for each school, four for each class and one senator-at-large. The story has been corrected and more context has been added. The Blackprint regrets the errors and stands by the report as. Joshua Dantzler jokingly describes himself as a “southern boy, turned northern boy.” He grew up in South Carolina with two sisters—one of which is his twin who attends Spelman College. The fast-paced feeling of living in D.C.—a lifestyle that feels foreign to the South—has given Dantzler reason to keep coming back for more. 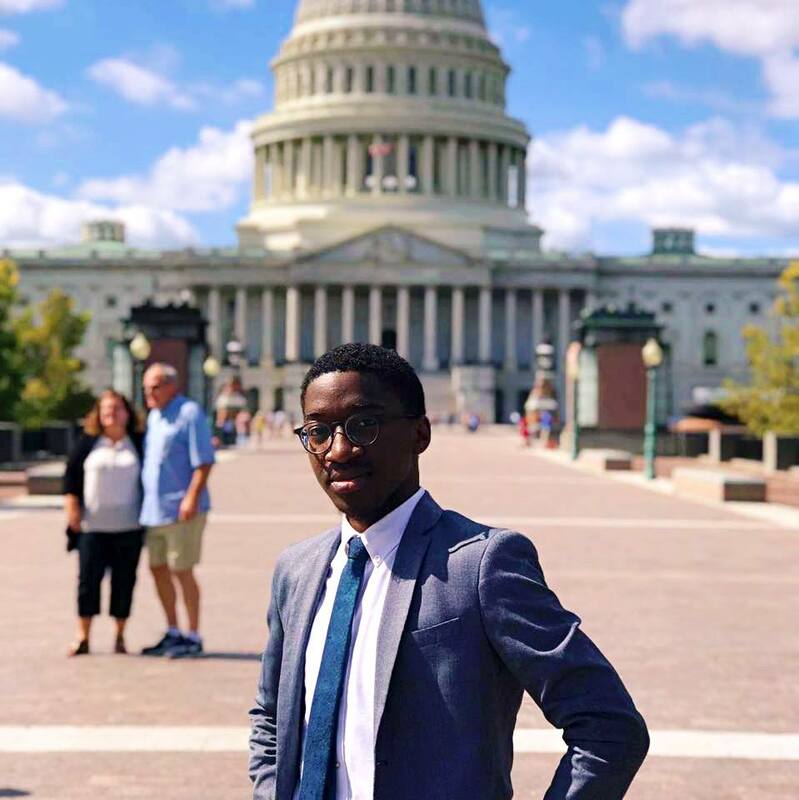 Dantzler in November was sworn into office as a Senator for American University’s Campus-at-Large. Pursuing a degree in political science, he is anything but a stranger to D.C. When he got to AU, Dantzler contemplated running for a position with either Kennedy Political Union (KPU) or the Undergraduate Senate. Describing himself as a very intentional person when it comes to diversity, Dantzler says the lack of diversity within Senate attracted him to the job. Within Student Government, there are 26 senators: three represent the School of Communication, School of International Service and School of Public Affairs (the Senate seats for the College of Arts and Sciences and Kogod School of Business are currently vacant); five for each class (except for the class of 2018, which only has three senators because two seats are vacant); and five senators-at-large. As a Senator-at-Large, Dantzler helps represent the interests of all 7,234 undergraduate students. “It’s hard because there are so many ideas, [and] so many people want change in various ways. Having to listen to all the constituents, my peers and my friends, and then through that listening, trying to decipher and prioritize what I can actually do and what can be done… it’s never easy,” said Dantzler. Dantzler went to two high schools. He spent his junior and senior years at a boarding school called South Carolina Governor's School for the Arts & Humanities. He chose theatre as his arts discipline; his program consisted of just 14 students. “You audition, apply and get chosen to go,” he said. “I spent the last two years two hours away from home in Greenville, South Carolina. It was cool because I was able to get accustomed to living away from my twin sister.” While at boarding school, Dantzler said he learned the importance of “balance, caring for self, discipline, how to do laundry” and more. While these skills certainly gave him a head start, Dantzler firmly considers college to be “its own experience.” “I had to grow up early in a sense, but college is still even more growing up,” he said. “[At boarding school] we had curfew, whereas college, you don’t have anybody to hold your hand. [You have to decide] between if you are going to this protest or class, this performance or this meeting, whereas in boarding school, everything was set for me. I didn't have to make those decisions on my own,” said Dantzler. Dantzler's active role in leadership dates back to middle school. He knew from day one that he wanted to get involved with student government once he got to college. “Being a Black leader [involves] having to explain and express the concerns of our people to people who can’t relate. Oftentimes, it’s trying to get white counterparts to empathize and see these issues and concerns,” said Dantzler. The job definitely is not easy. “Fighting for people can be tiresome and no day is a perfect day,” Dantzler said. However, he said he is “used to the rough and tough days.” After all, he’s been doing this since sixth grade. “You don't have to be the boss... or the president of any club or organization. A leader knows the way, goes the way and shows the way,” said Dantzler. “Leadership is all about leaving the door open for people behind you to come in." Filmmakers Reveal History of Local Lynchings in "An Outrage"